The summer of Japan! The summer of Hello! Cons! A direct hit from this 'senpai - kouhai' pair who are garnering attention!! These 2 are making an appearance in the 2nd half! At any rate, Ishida Ayumi's adoration towards Suzuki Airi is something substantial. Even in this interview, she got so nervous that she'd often space out, we expect that her abundance of respect will be conveyed through the pages of this magazine. On the opposite side, Suzuki was oneesan-like as well, and it left an impression, seeing her deliver warm advice. It would be great to see them together in a unit someday. Hyu-! Hyu! 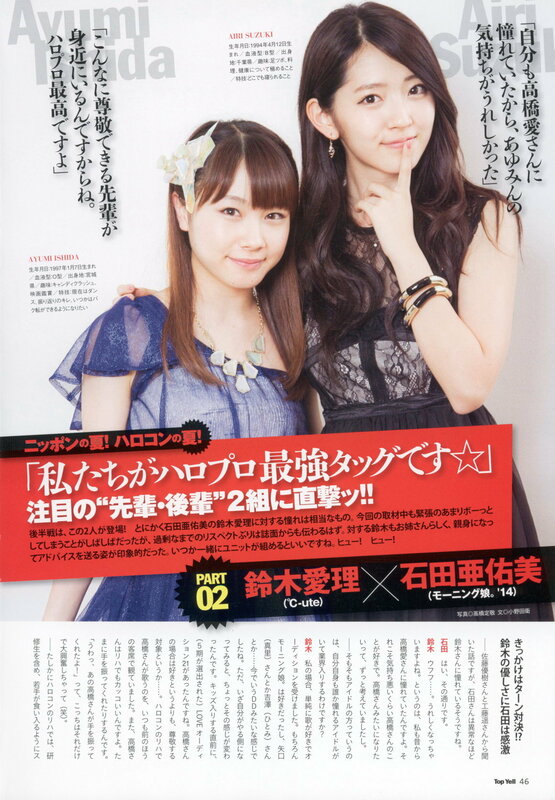 Suzuki: I looked up to Takahashi Ai-san, so I'm thankful for Ayumin's feelings. Ishida: The senpai that I hold in such high esteem is close to me. That's why Hello! Pro is the best. It started with a 'turning' showdown!? This is a story we heard from Sato Masaki-san and Kudo Haruka-san, but it seems that Ishida-san admires Suzuki-san to an abnormal extent. Suzuki: Ufufu. That makes me happy. That said, I too used to admire Takahashi Ai-san from ages ago. I liked her so much that it was disgusting. I was always wishing that I could become like Takahashi-san. First of all, for idols, is it the case that you yourself joined the industry because there was some idol you looked up to? Suzuki: In my case, I simply liked singing, so I took up the audition. Of course I liked Morning Musume., like Yaguchi (Mari)-san or Yoshizawa (Hitomi)-san... Something like what they now call a DD. It's just that, once I had started on this side, that changed a little. Just before I joined the Kids, there had been the LOVE Audtition 21 (in which the 5th gen were selected). Rather than saying I liked Takahashi-san, you could say she was the target of my respect... When Takahashi-san sang at Hello! Con rehearsals, I'd always be watching her at the front row. Takahashi-san was so cool even at rehearsals. She'd occasionally wave to me. 'Whoa, Takahashi-san is waving to me! ', even that had me really worked up (laughs). Indeed, at Hello! Con rehearsals, when you include the Kenshuusei, the younger ones are staring at the stage. Suzuki: At the time, there still wasn't anything like the HinaFes. I have this impression that Hello! Cons were rarer than what we're used to now. At Hello! Cons, I'd be able to watch Takahashi-san directly, and it was really valuable study time... Anyway, so far it's just been me talking one-sidedly about Takahashi-san, I haven't been talking about Ayumin at all. Sorry (laughs). Ishida: No, it's all right (laughs). Since just listening to your stories is interesting enough. But when I'm watching Suzuki-san at Hello! Con rehearsals, I concentrate quite a bit too. Of course I do like you normally, but I'd also like to learn how to create such facial expressions too. Suzuki-san, haven't you been growing out your forelocks recently? I really like seeing the way Suzuki-san's hair unravels itself when you're dancing. So at the current Hello! Con, I'd like it if my hair would come undone with a swish, and silently flow off to the sides. She's truly obsessed (laughs). Sato-san also pointed this out, that you'd check her out to the point that you'll notice the minor details that most people wouldn't, like 'Suzuki-san's singing today was a bit different'. Ishida: I notice the differences. Having done that, it makes me want to mention it to someone. But, it's not like I can just tell it to Suzuki-san herself. So I tell the 10th gen, 'Suzuki-san's a bit different today. Did you know? ', but every time it ends up annoying them though (laughs). Suzuki: I get it! When I'm watching Takahashi-san in (Onna to Otoko no) Lullaby Game, for example, I notice things like 'Oh, she did that today!' But I couldn't say it to the person herself. Something like 'Takahashi-san, you did that today' (laughs). Ishida-san, what was it that started you on the path to becoming such a Suzuki devotee? Ishida: The very first thing wasn't a performance of hers or anything like that. Immediately after I joined Morning Musume., there was a Mobekimasu event. And, for some reason, I ended up doing a 'turning showdown' with Suzuki-san. What do you mean, a turning showdown? Suzuki: No, those are completely false rumours (laughs). It isn't my speciality at all. Ishida: Is that so. So for Suzuki-san to do it, even though you had no interest in turning, I unwillingly dragged you in (laughs). But having gone along with the showdown, you spoke so kindly to me backstage... And I liked you since then. As a newcomer, I hadn't talked with senpai outside of Morning Musume., so I feel that Suzuki-san was probably the first. For Ishida-san, your first impression was that of 'A kind senpai'? Ishida: I'm kind of shy. Even now, approaching a senpai to talk with her is something I'm really bad at. But, when we were in the middle of practising for a Hello! Con, my eyes met Suzuki-san's, and she gave me a grin. That really made me happy... At the beginning, rather that 'admire', the feeling of 'like' was probably stronger. Starting from that, I slowly got captivated. Talking about that, there was a time when Suzuki-san made a surprise appearance at Ishida-san's birthday event. Ishida: That was awesome. For my 16th birthday event last year, there were 2 performances on that day. At the 1st one, a voice message from Suzuki-san was played at the venue. We were told over the PA system that 'We've received a message from a particular person', and at first I had no idea who it was. The moment I realised, 'Ah, it's Suzuki-san! ', I was elated... And what's more, Suzuki-san herself made an appearance at the 2nd performance! That had me tearing up. Suzuki: You cried, you cried (laughs). But on that day, I definitely was elated. Anyone who's receiving admiration would be like that. Being told that you like me, it actually makes me feel extremely happy. That's unexpected. Within Hello! Pro, there's this impression that Suzuki-san has the respect of a lot of the members though. Suzuki: It's impressive for Natsuyaki Miyabi. It might just be what's written in magazine surveys, but there weren't any people who said it straight to my face like Ayumin. If you admire someone to that extent, the person being admired would be really happy. It's just that at that time, I went overboard and sewed something, right? Ishida: I was given a pink blanket with Suu-san. sewed on it as a present! Suu-san. wasn't an unwelcome favour? Ishida: Not at all! What's more, the blanket has Suzuki-san's scent. It makes me really happy, I really treasure it. Suzuki: On that day, even I got overexcited. The fans were telling me, 'Airi-chan's speech was even less comprehensible than usual'(laughs). Have the 2 of you ever thought about forming a unit? Suzuki-san has talked about what she's learnt from Takahashi-san, but has Ishida-san learned from Suzuki-san's performance? Ishida: Of course I have. Particularly from the aspect of expressions. When I see an example of Suzuki-san expressing herself, she's definitely skilful in the way she presents herself. The way her gaze moves to match the flow of the dance is something I still can't do. And speaking about facial expressions, it's not just smiling and showing a sad expression. For example, those cameras that capture what gets projected at the monitors of the venue. At those times, it's not just about gazing into the camera, it's letting your gaze stray according to the lyrics, or going back in another way... In that way, having variation in facial expressions becomes important. I've learnt a lot. Did something like graduate (laughs)? Suzuki: Well, at the time, I asked her herself. 'Who should I set as my goal and learn from?' And then, Takahashi-san told me something on the lines of 'Don't worry. Because Airi stylish'... Somehow, I'd gotten praised. 'Hey! Why are you giving me praise!' I thought. I cried because of that. As for the real story, who is Suzuki-san using as a reference now? Your points are the same. Suzuki-san, you learnt about expressiveness from Takahashi-san. Similarly, Ishida-san is learning about expressiveness from Suzuki-san. Is this how the training of skills is done in Hello! Pro? Suzuki: No, no, it would be better for Ayumin to learn from Takahashi-san too. I'm the 2nd generation, since Takahashi-san is the original. I'm telling you, Takashi-san's expressions when performing at a Hello! Con were jaw-dropping! After all, she gets into the world of the lyrics that she cries while singing, right? Even the video staff-san say that. 'Takahashi did it even more impressively'. Ishida: I've never been criticised like that. When you get down to it, I think that it means that I still haven't got to that level. Suzuki: That's not the case. The recent young ones have been absorbing things quickly, and they have presence. I think that's really amazing. Ishida: Being in Hello! Project, isn't it because there are lots of great senpai close to us, starting with Suzuki-san? I think it's a really blessed environment. It's the best, H!P is. Well then, from Ishida-san's point of view, please tell us what we should look out for in this Hello! Con when it comes to Suzuki-san. Ishida: For the 2nd B melody of 'The Power', Suzuki-san has a solo part. At that time, the movements of her whole body and the movements of her gaze are linked. I'd like you to keep your eyes out for that. Suzuki: That's extremely detailed~ (laughs). But, Ayumin will be graduating from high school next year, right. Once that's done, let's go out for the occasional meal. I'm bad at asking people out too, so I've got no confidence. Suzuki: So, how about this! First, the 2 of us will go for a movie. Then wouldn't it be all right to have a meal while talking about the movie? If we can do that, perhaps we might have a lively conversation about what made our chests squeeze. If not, the 2 of us can't go for a meal (laughs). "(The rest of Suzuki's repeated stories of her memories of Takahashi Ai which continued endlessly have been largely omitted)"